When I was in fourth or fifth grade, my mom and I spent a mother-daughter weekend in Williamsburg, Virginia. We visited Colonial Williamsburg and went to Busch Gardens. We had pancakes for breakfast and ice cream in the afternoon. Oddly, however, despite all the touristy things we did, the thing that I remember most vividly about that weekend was sitting in our hotel room, reading Madeleine L’Engle’s A Ring of Endless Light together. It’s been years since I’ve read that book, so I don’t remember it in detail (The basics: It’s about a teenage girl named Vicky who goes to spend the summer on the island where her grandfather lives. He is dying of leukemia, and she and her family know this is the last summer they will spend with him there. On the island, Vicky spends time with three boys, all of whom have their own experiences with death. Needless to say, it is not a particularly light kids’ book. But it is incredibly poignant and lovely). But I do remember my mom reading the book aloud to me in that motel room in Williamsburg while we both cried and cried. I am not alone in having happy childhood memories tied to Madeleine L’Engle’s books (most of which are intended for middle readers–grades 6+). And for good reason–they are, simply, great. L’Engle is probably best known for A Wrinkle in Time, a Newbery Medal Award winner from 1963, which is about some kids’ adventures through space and time to save their dad. 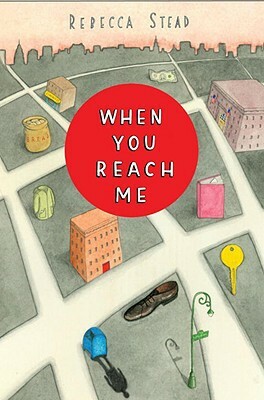 When You Reach Me is, in part, an homage to A Wrinkle in Time, young protagonist Miranda’s favorite book. She carries around a worn copy with her wherever she goes. She has read it hundreds of times and knows it backwards and forwards. Miranda is in sixth grade and has been best friends with Sal, the kid who lives one floor below her in her apartment in NYC, for years. But things are starting to change. One day, when they are walking home from school, a random kid sucker punches Sal, and Miranda stands by helpless. After that, Sal doesn’t want to hang out with Miranda like he used to (Miranda assumes he’s just embarrassed by what happened), and Miranda is forced to make new friends. Miranda has to navigate the new (and, to her, confusing) dynamic with Sal, relationships with new friends (whose quirks she doesn’t yet know), her first crush, jealousies, and fears. Miranda soon discovers that her favorite book connects her to two people she doesn’t particularly like: Julia (one of her new best friend’s former best friend) and Marcus (the boy who punched Sal). Meanwhile, weird things keep happening. The key that she and her mom hid goes missing, and their apartment gets opened up . . . but nothing gets stolen. Miranda begins finding random, eerily prescient (and rather creepy) notes in odd places. And a scary homeless man starts hanging out near her apartment and around her school. All of these weird things are tied together, and Miranda slowly unravels the mystery connecting them. In terms of adult enjoyment, I can’t give this book a particularly high rating (maybe a 3/5? ), because it is written for such a young audience. That said, if you have youngsters (grades 3-7), then I would highly recommend this for them. As a read-aloud book, this is a great choice (appropriate, I would say, to read to second through fourth graders). It deals with the difficulties of changing friendship dynamics, bullying, independence, and becoming aware of the impact of differing socioeconomic backgrounds. It is cute, fun, and fanciful, and it’s a celebration of smarts and friendship and quirkiness. And, as good kids’ books do, it has some great lessons (“Sometimes you never feel meaner than the moment you stop being mean. It’s like how turning on a light makes you realize how dark the room had gotten.”), without being at all preachy. Who should read it: Mom (Madeleine L’Engle fans); Danielle (people who have adorable kids with whom they could enjoy this book). This entry was posted in Rating: 3/5, Rating: 4/5 and tagged A Wrinkle in Time, Book review, Book Reviews, Books, Madeleine L'Engle, Newbery Medal, Rebecca Stead, When You Reach Me. Bookmark the permalink. Thanks for the memories ;)–and the recommendation-sounds good! It will take you about 45 minutes to read, but you will enjoy it! Perfect for my summer reading list – was already looking forward to a wrinkle in time with my almost-fourth-grader… I am loving the re-discovery of my old favourites through her. A perfect age for both books! Enjoy them! !